When you're at work for hours on end, it's no wonder that by the end of the day your feet are killing. And we know how annoying it is, so that's why we have so many shoe options. Especially for the culinary, hospitality and medical industries, work Crocs are easy to clean and have non-slip soles, as well as being super soft, supportive, and light. So you might be at work but it feels like your feet are on holiday. 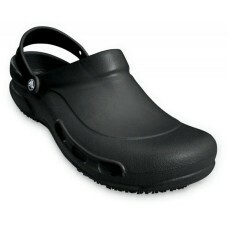 No one needs-or deserves-comfortable ergonomic shoes more than people working in food service hospit..